The closer it gets to Christmas the crazier it gets around here. I always feel like I have a good handle on things after Thanksgiving but when the second or third week of December roll around I’m running around like a chicken with my head cut off! I’m usually trying to finish holiday cookie orders but I also have to make holiday treats for my students at school. I’ll be honest here, while I’m a big fan of making totally homemade treats sometimes when I bake for the kids at school it’s just easier to use a box mix. They don’t care because they are all about how the cupcakes look and not nearly as worried about how they taste. 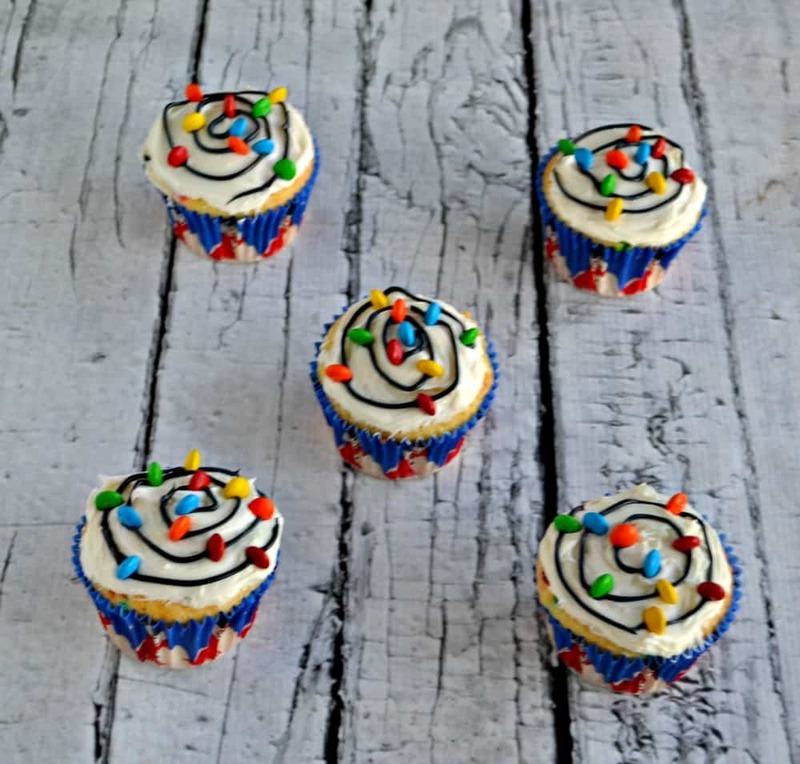 So this year I’m making these super fun Christmas Light Cupcakes for them. 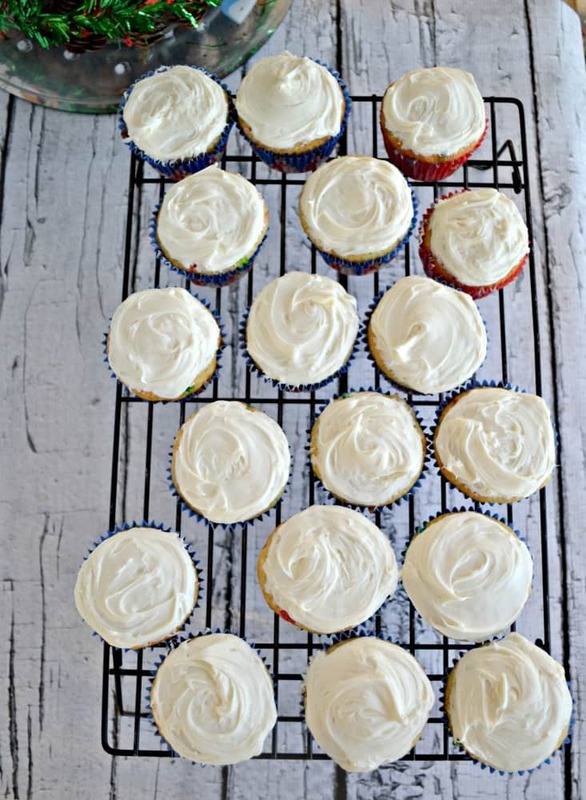 I used a regular boxed cake mix and whipped up 2 dozen cupcakes. While you can use canned frosting I do like to make my own. So while the cupcakes were baking I made a simple batch of buttercream frosting. I put a half cup of the frosting in a separate bowl and dyed it black while I left the rest of the frosting white. I frosted the cupcakes with the white frosting and placed them on a rack. Then comes the decorating. 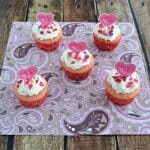 It’s so easy to make these cupcakes and they turn out really cute. 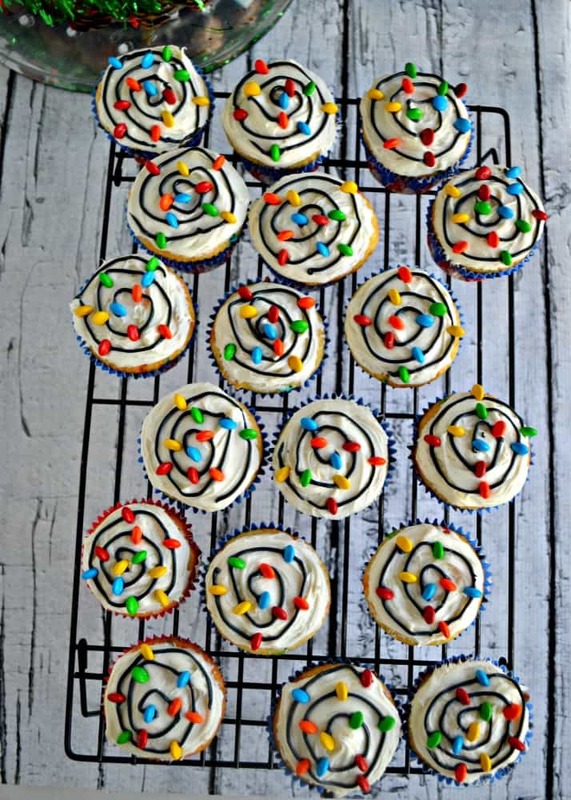 I simply had to pipe the black frosting on top of the cupcakes in a swirl pattern. Then I took mini M&M’s and stuck them on the black swirl to make the “lights” on the strand of Christmas lights! It took me about 20 minutes to decorate 2 dozen cupcakes and then they were ready to go. This would be a good one for the kids to help out with too! 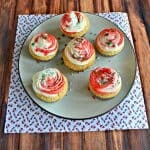 Using a box cake mix these cute Christmas cupcakes are a snap to make! Make the box of cake mix according to the package directions. Divide between 24 muffin cupcakes and bake as directed. Cool the cupcakes completely. Meanwhile, place the butter in a large mixing bowl. Beat on medium speed until smooth. Add in the vanilla and mix well. Add the powdered sugar, a half cup at a time, until desired consistency is reached. Mix in the milk and then add more powdered sugar if needed. 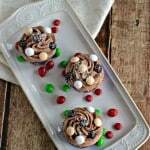 Remove half a cup of the frosting to a separate bowl and dye it with the black food coloring. 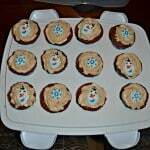 Frost the cupcakes with the white frosting. Put the black frosting in a piping bag and pipe a black spiral, starting at the middle and going to the edge, around the cupcake. 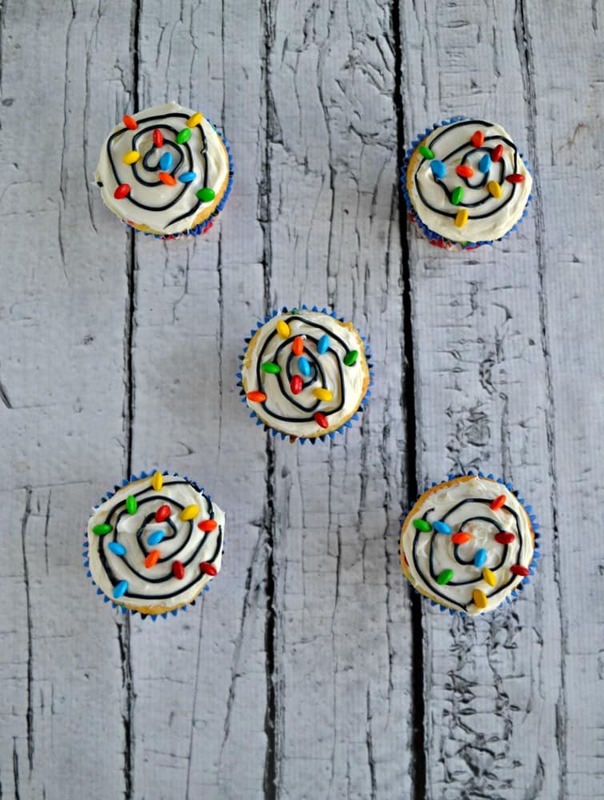 Place mini M&M's on the spiral to look like Christmas lights.